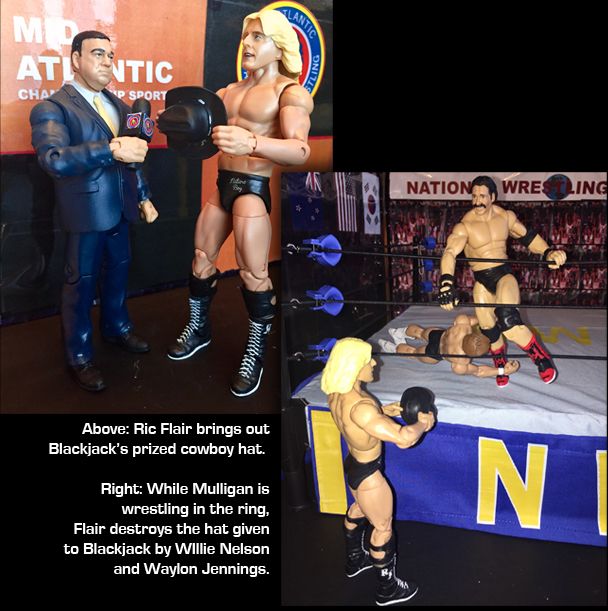 Last week, we presented PART ONE: THE HAT of a two-part "Action Figures Friday" series commemorating the famous "Hat and Robe" angle from 1978 featuring Ric Flair and Blackjack Mulligan. This week we look at what happened next in PART TWO: THE ROBE, where Blackjack extracts a matter of revenge on Flair for earlier destroying his prized cowboy hat given to him by Waylon Jennings and Willie Nelson. When people write us or post on our social media about their favorite angle form the 1970s in Mid-Atlantic Wrestling, the one they bring up most often is the 1978 angle known popularly by fans as "the Hat and the Robe." It's our favorite, too. As we mentioned last week, we won't run through the whole story here. There is a detailed (and we mean detailed) article on the the entire "Hat and Robe" angle and its aftermath that was originally published in 2004, and then updated and republished in 2015. You can catch up on that whole story by going there first if you'd like. Mike Simmerman again sent us photos from his custom action figure collection that re-enact the famous angle. This week, it's the robe. Ric Flair watches helplessly as Mulligan slowly shreds his $10,000 custom Oliva Walker robe. Ted Oates holds Flair in the ring. Mulligan is seen in the inset image in each frame. Flair kneels in what remains of his once most prized robe. Special thanks as always to Mike Simmerman for providing these very cool (and very creative) photographs from his custom figures collection. Check out all of our "Action Figures Friday" posts.